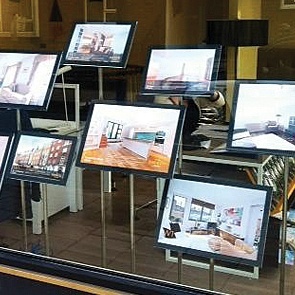 Create professional window displays for estate agents in just a few clicks! AgentPro's software makes it simple to select a template, automatically add property details and images, and then customise to produce picture perfect window cards ready for your estate agents window displays. Window cards in a few clicks. AgentPro is a complete, cutting edge software package for lettings and estate agents. The system can be used for absolutely anything, from handling the finances of a multi-branch agency to automatically updating multiple property portals. 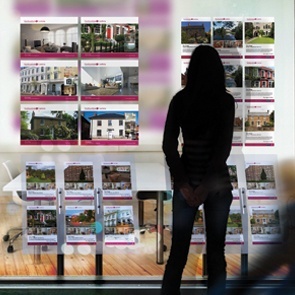 Unsurprisingly, generating great looking window cards for estate agents window displays is a walk in the park. With all of your properties already in the system, it's simple to select your ideal window card template and automatically fill it with details and images from your selected property. Once you've chosen and customised your templates, it's a simple matter of click and go! Eye catching designs that complement your brand. Your corporate identity is a big part of your success as an estate agent. All of our window card templates have been carefully designed by AgentPro's design team to look the part and to show off your business to their greatest advantage. The key to an eye-catching window card is in the photos and unlike our competitors we don’t shrink these down. Your properties are shown in their full glory with clear, high quality images. Each template includes space for your branding, but if you're considering a bit of a revamp, the AgentPro designers are always happy to help. We've helped to redesign branding for a number of estate agencies, turning their old look and their new ideas into brilliant, fresh designs. Whether you operate a single branch estate agency or work as part of a large multi-branch business, consistency is essential when it comes to your branded materials. AgentPro's templates ensure your will remain consistent with a highly professional finish. Doubled sided, A3, A4 & A5, AgentPro offer a number of different window card options. Each template also includes a number of customisable features including fonts, font sizes and photograph positioning. To discover how AgentPro can help you to create stunning estate agent window cards in just a couple of clicks, get in touch today on 08456 444 446 or email info@agentpro.co.uk to arrange a free demo now.